For a short time, my son was involved in an airsoft club in high school. At that time I started thinking that it might be a useful way to practice for shooting real guns. 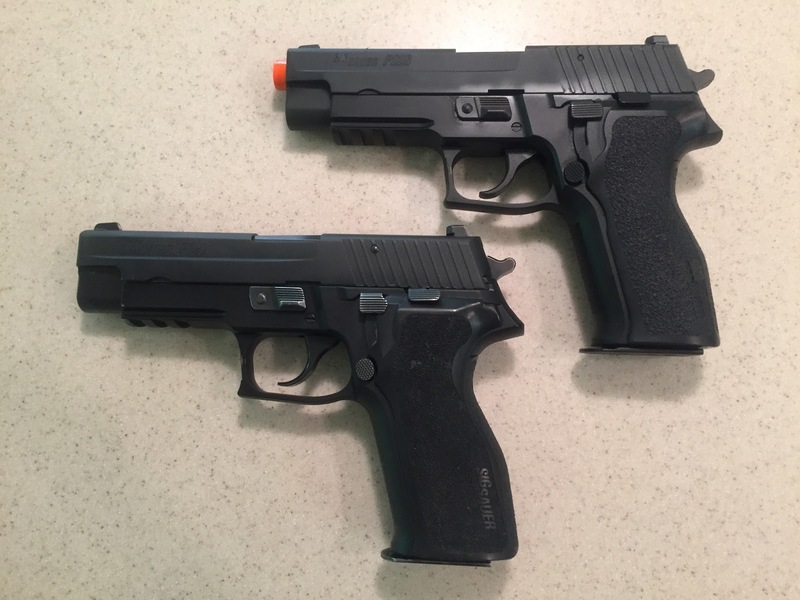 I forgot about it for few years, but recently picked up a Tokyo Marui SIG Sauer P226 airsoft replica. The gun is a very close copy, in ergonomics and operation, to the real thing that I often carry and shoot in matches. After opening the box, I discovered that the manual is written entirely in Japanese. There are drawings too, but sometimes it's not clear what they are trying to depict. Fortunately I'm pretty familiar with how to shoot a pistol, so some of it was easy to interpret. But other parts of the instructions are less clear. After ordering some propellant and BB's online, it was time to shoot. I plan to enhance my shooting practice with the airlift replica. I'll be able to work on movement and drawing drills, right in my backyard. Having the "bullets" hitting the target will keep me more honest with sight picture too. A repair center or paper practice target placed over a well-shot out cardboard target ensures the plastic pellet leaves a hole even at distance. My first practice session with the gun was spent working on shooting while moving sideways, a skill deficit I noted at my last IDPA match. I'm looking forward to setting out a barricade to shoot around as well. It's probably fortunate, at least until the trees drop their leaves, that my backyard is well hidden from the neighbors' views. In the end, I don't know how much more beneficial airsoft will be over regular dry fire practice, but shooting the airsoft pistol is certainly fun. And that's enough reason to try it.